The Early Childhood Hourly Care Program offers hourly care options for infants and children ages six weeks to five years. The Early Childhood Hourly Program’s mission is to provide intermittent and occasional childcare for patrons. The West Point Early Childhood Hourly Care Program provides a variety of experiences for infants and children through developmentally appropriate activities, interactions and environments. Interactions and activities are designed to promote growth in the areas of Social and Emotional Development, Physical Development, Cognitive Development and Language. Development. The School Age Hourly Care Program offers hourly care options for children in kindergarten through fifth grade. The West Point School Age program provides a variety of experiences for children through planned developmentally appropriate activities, interactions and environments that promote learning and exploration in four service areas of; sports, fitness and health options; life skills, citizenship, and leadership opportunities; arts, recreation and leisure activities and academic support, mentoring and intervention. Hourly care is available during the academic year before and/or after school. 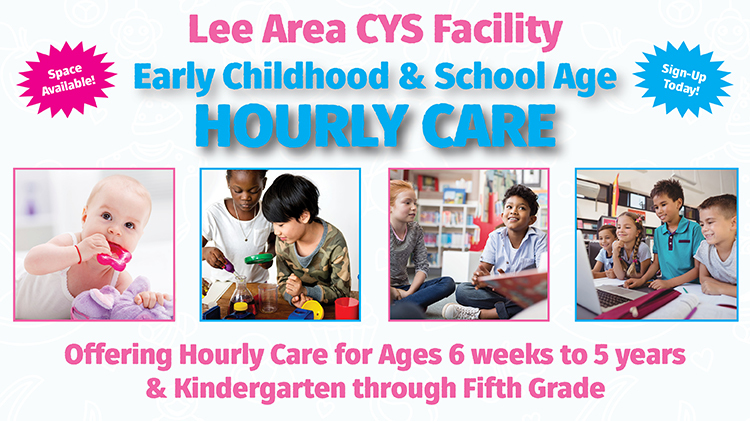 Hourly care is also available during half day and school out days. Both programs will be closed during Code Red/Mission Essential timeframes. As per Army/DoD Fee Policy an $8.00 fee will be applied to "no shows". 1st Grade - 5th Grade: Four free hours per month, after 4 hours it is a fee of $4.00 per hour. Once a SAC hourly patron utilizes 5 hours of care in one week it is $16.00 flat fee for less than 4 hours of care per day and a $30.00 flat rate fee for more 4 hours of care per day.